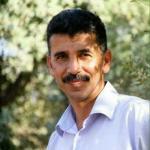 Salah Khawaja is in Israeli jails since the night of October 26 when Israeli military forces have arrested him from his home in Ramallah. Until November 17 Salah has been subjected to almost non stop interrogation, including psuchological and physical ill-treatment. Since then interrogation have stopped, yet Salah is still in Israeli jails and the military judges are dragging out any decision on his case. do not cooperate in any way with Israeli institutions involved in the Israeli regime of repression of human rights defenders. For a model letter you can click here. Salah Al Khawaja, 45 years old, has dedicated his life to the defence of Palestinian human rights and empowering local communities. Al Khawaja is part of the Stop the Wall coordination committee, secretariat member of the Palestinian Boycott, divestment and Sanction Committee (BNC) and one of the leaders of the Palestinian National Initiative (Mubadara). He is widely respected for his work, has addressed numerous national and international civil society conferences and has as well met the diplomatic community in Palestine in many occasions.